Given the ongoing debacle over PB's bilking of funds for the Robotech RPG Tactics kickstarter, and the inextricably related pulling of the Rifts Board Game kickstarter (which in particular involves arguably the most shameful act of KS's career), I think the company has burned all bridges in the miniatures market. One's likely better off bolting a bit of mecha rules to a fantasy minis game and making do with assorted figures. PB released some paper miniatures, that are honestly better off ignored, if for no other reason that they don't include anything iconic. Their old lead minis are of pretty low quality, but I could see an argument for picking up a Glitter Boy and SAMAS. Ever since I was a teen, I’ve joked that if I win $100 million in the lottery, I’m gonna take $5 million of it and buy Palladium outright. Then announce a new edition of the game. No backwards compatibility at all. Scored earth. Scrap everything but the fluff. Get modern artists to redo some of the classics, but in color. Hire someone like Sean K. Reynolds or Robin Laws to rebuild the mechanics from the ground up. Last edited by MacynSnow on Tue Jun 05, 2018 12:16 am, edited 1 time in total. -Probably the most iconic "Game-Breaker" thing in all of Rifts is the Glitter Boy. 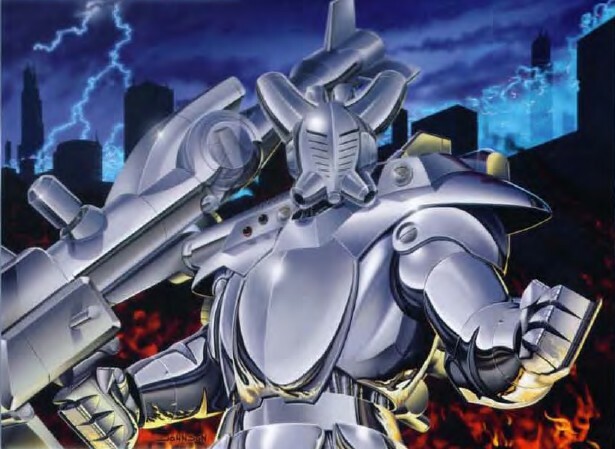 One of many icons of the setting, these things look AWESOME- giant, gleaming robot suits standing ten feet tall and sporting the most ridiculous gun in the entire Main Rulebook. It sports a higher MDC than any other Robot Suit, too- 770 MDC!! The game was originally going to be called Boomers, in fact- a sign of just how big a deal these things are. The stereotype of the typical "Glitter Boy Player" is a guy so afraid of getting outside his suit that he "camps out" in it, even eating the "Flavor Paste" said to be within the thing. My friend's campaign consisted of a lot of that, apparently- since ANY bullet could kill you outside of your suit, you were wise to stick to it. -In the setting itself, Glitter Boys are "Pre-Rifts" technology, making them rare and wondrous creations. Emblematic of the society of "Free Quebec", they're outlawed in the Coalition States, giving them a very "Robin Hood" sentiment elsewhere. The O.C.C. bio indicates that their pilots are combat-loving travellers, earning "just under those of a crazy" (... WHAT? ), or simply being a champion of the right cause. Fun fact: I always assumed these things were gold-colored because of the way they shaded the black & white pics. I was a bit stunned to see SILVER Glitter Boys on the covers of books. So yes, I missed the part where it said they were "chrome", and apparently always meant for them to be shiny silver. -For stats, the Glitter Boy is nearly unsurpassed- the only stuff better is usually found in space or in a Giant Robot piloted by numerous people. The stats of the pilot are pretty ordinary and unimpressive, but a Glitter Boy is so mighty that the rest of Rifts Earth has been playing "Catch-Up" ever since, with only a handful of superior armors being found (usually from societies that already had Glitter Boys). The gun ramps it up to PL 12, owing to the fact that it's four times stronger than even a SAMAS Suit's Rail Gun. Last edited by Jabroniville on Tue Jun 05, 2018 6:43 am, edited 1 time in total. my real dream is to find out who currently holds the rights to Dino Riders and turn that into a roleplaying game and miniatures wargame. I actually perfered MASK fan myself.Maybe it's due to being raised by Rednecks who treated NASCAR like a religion,but the thought of transforming vehicle's into Other vehicle's with the pilots having Super-gadget's facinated me just a little bit more than Armored Dinosaurs trying to kill each other(that and they never seemed to have anything but MASK or G.I.Joe when i got my allowance). Dino Riders was one of the many casualties of the highly competitive toy-and-cartoon market in the Eighties. Only fourteen episodes were ever produced and only eleven of them actually got aired in 1988. Three would up as direct to video. The toy line only lasted three years, 1988-90. Without a cartoon to keep kids interested, there was just no way it could last when facing G.I. Joe, Transformers, and the behemoth that Teenage Mutant Ninja Turtles was about to explode into. In a weird twist, the Smithsonian Institution contracted Tyco to reproduce the dinosaurs (without the laser guns and body armor) for their "Dinosaur and Other Prehistoric Reptile Collection.” That line of toys lasted for over a decade! I just can’t help by imagine how awesome those incredibly accurate dinosaur designs, matched with detailed 32 mm scale infantrymen, would look on a gaming table. It’d be epic. A reminder that I statted out all the Dino-Riders, and have hoarded a near-complete collection of the toys (goddamn Pachyrhinosaurus...) . MacynSnow, don’t get me wrong, M.A.S.K. was a cool show and the damn theme songs been stuck in my head since 1986... But I don’t think it would work too well as a miniatures game. Hard to incorporate the transformation gimmick into tabletop gaming quality models. Seems like it would be a great roleplaying campaign though. Motivation (Saving Lives)- Body Fixers heal because they see life as important. Prejudice (Inhuman-Lovers)- Body Fixers will practice medicine without a license on those the Coalition despises, such as aliens or mages. -Yes, in the world of Rifts, even the DOCTORS are Mega-Damage-dealing bad-asses. God I love this game. Something I'd never even considered (I don't even remember this Class being a thing), a Body Fixer is basically Doctor who operates on ANYBODY- including D-Bees, Mages, etc.! This makes them enemies of the Coalition- a class of Rebel Doctors who do things because they're nice and other gross things like that. Some are apparently evil, but these guys are said to abhor cybernetics, thinking it a sin against the human body. -Body Fixers are like Rogue Scholars & Scientists, being just a notch beneath them on the scale of "Skilled People". You should really take a look at Shanna Germain's Predation setting. It's literally a 200 pages long love letter to Dino-Riders. I really liked the setting, but the Cypher System is just too navel-gazey for me. Personally I think there's a lot to love there, but that might be because I work on translating it. It’s been a while since I read it; I remember finding the setting rich, the background full of neat hooks, and of course who doesn’t love the concept — dinosaurs are inherently awesome! — but the mechanics of the game were off putting in how “meta-textual” they tried to be. Maybe that was just the overly florid language too many of Monte Cook’s post-WOTC products have, maybe I was just in a grumpy mood the week I read it. Absolutely gorgeous artwork though. One of the prettiest books I’ve read in all my years in the hobby.